Gartner’s recent CMO Strategy Survey finds that marketing leaders continue to gravitate toward more customer-centric strategies but often lack the underlying operational excellence to effectively deliver compelling customer experiences. Specifically, just 51% of marketing leaders rate their companies as effective at acquiring and using marketing technology. About one in five say that they are downright ineffective at leveraging martech for business advantage. Marketers also report heightened scrutiny from their CFOs about martech spend and the return on that investment. Many of these issues arise in my conversations with clients. It’s rare that marketers tell me they don’t have enough tech in place today. Sometimes they have too much, and they’re working to rationalize and consolidate the loose collection of marketing tools dispersed across their different business units. They’re also often looking to cultivate capable talent and leadership to build solutions that deliver actionable customer insights to marketers and personalized engagement with target audiences. Better collaboration with their IT, product, sales and finance counterparts is another recurring theme. Fill out Gartner’s interactive Marketing Maturity Assessment to level-set on current capabilities and identify gaps across key functional areas like customer experience, multichannel marketing, digital commerce, marketing analytics, and operations. The resulting analysis helps you pinpoint potential areas for martech extension or net new deployment. Get your martech house in order by conducting an enterprise-wide audit. Gartner provides a toolkit with benchmarks by business context to help you quickly kick off your internal evaluation. It’s also a great way to help discover internal power users and evangelists for specific tools, as well as spot where new champions are needed. Develop an adaptable marketing technology roadmap that defines the phases and resources required to close gaps and move up the maturity curve. Determine how to maximize existing marketing technologies before seeking out new tech. Solicit feedback from internal business users to help identify bottlenecks and immediate areas for improvement. Collect and analyze customer feedback to surface quick wins that will improve their experience and add value. Although you need to be a Gartner client to access all of the above resources, fellow analyst Kirsten Newbold-Knipp and I recently hosted a free webinar that’s now available on-demand where we shared some of our in-depth research on how brands can benchmark and mature their approach to martech. One key takeaway is that marketers are working to actively collaborate with their IT counterparts as they forge a path toward martech enlightenment. 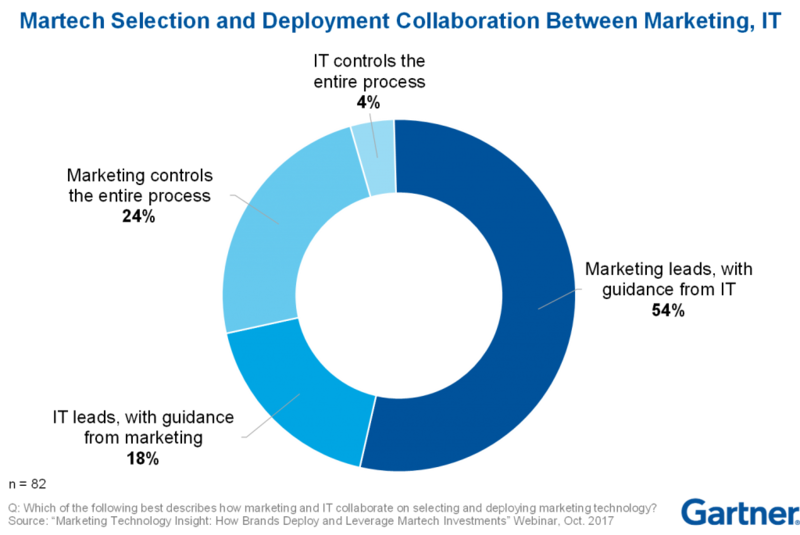 A majority of respondents report some level of cooperation between marketing and IT, with marketing commonly taking the lead while receiving guidance from IT. The priorities of modern CIOs around digital business transformation increasingly align with the customer centricity mandate of modern CMOs. And as the lists of marketing leaders’ responsibilities get longer, the technology they need to leverage must integrate with the rest of the business to deliver smart, cohesive experiences across individual journeys. More brands are employing dedicated marketing technology leaders to own the martech vision, build the roadmap, navigate the vast and complex martech landscape, and spearhead collaboration with the rest of the business. These leaders can effectively steer companies through through the steps it takes to achieve martech maturity.